It’s about time for a new entry here. In the last couple of days, a lot has happened and I’m going to try to sum it up as good as possible. 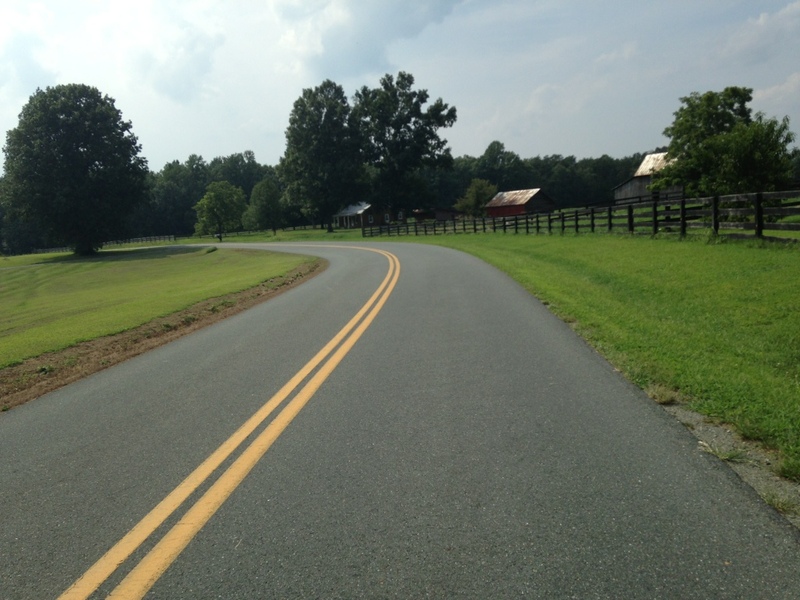 The first day after my little sightseeing break in D.C. led me to Fredericksburg in Virginia. 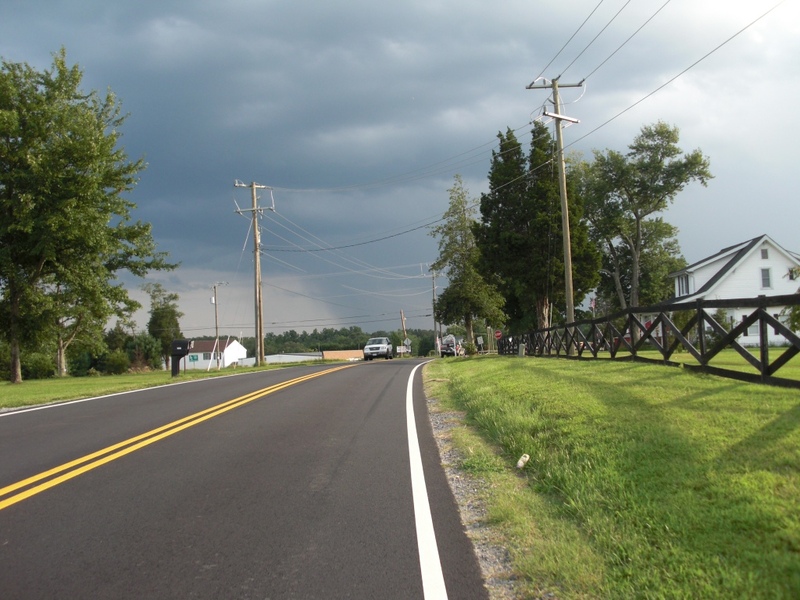 Unfortunatly I never got to take a picture with a the state sign because I was on a bike trail – the Mount Vernon Trail. It was a really nice ride until the trail ended. After that it was the worst stretch of the trip so far. Narrow countryroads, no shoulders, a lot of traffic on my side of the road and most of them rednecks in pickup-trucks who passed me with not a lot of space. On top of that it was about 40 degrees Celsius (105 F) and the humidity incredible. And it was going to be one of the longest distances with 130km or about 80 miles. All in all a rough day and when I got close to my destination, big dark clouds appeared on the horizon and I hurried up to get there before the thunderstorm. The next morning I headed to a bike-shop in town to get a few things checked out. Ever since they adjusted my saddle, my knee problems are gone – big thanks to the guys from the bike shop in Fredericksburg! The rest of the day was interesting and it includes one of my big fears on this trip – thunderstorms. It might sound weird, but if you are on the countryroads on your bike, there are NO places to stop and take cover in case of a storm. And they can get pretty intense. That day, all of the sudden it started raining like crazy – I would say I have never seen that much rain for such a long period of time. Maybe I was just riding with the storm, but I had rain for about 2 hours and the roads turned into rivers. And on top of that, there was lightning and thunder. So the bike is probably not the thing you want to be on during a storm. But there was simply nowhere to go. Finally I had found a small church and waited there for about 15 minutes. 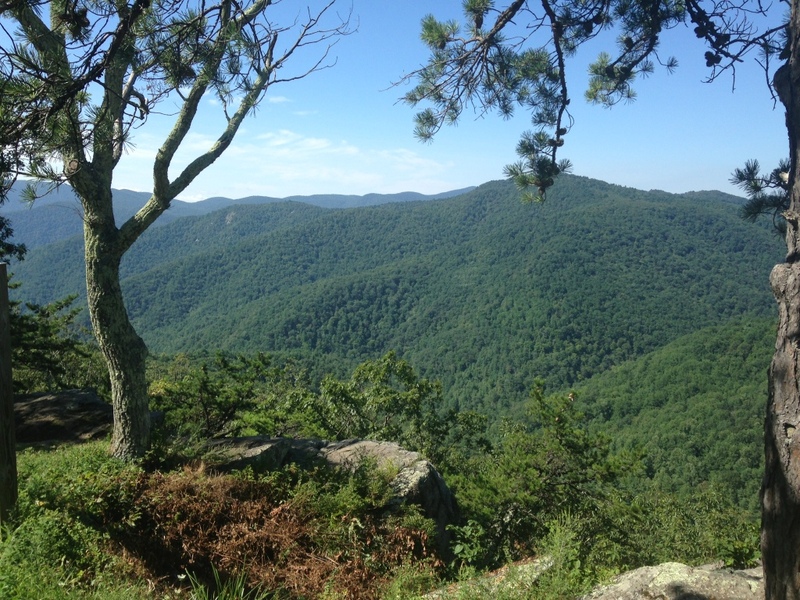 I had passed/gone through the worst part already though and had a decent ride to my destinstion – it was close to Ashland, Virginia and from that point on I would join the Transamerica Trail and finally head westward! I was really excited for that. But I ended up having a pretty relaxing sunday instead of going west on my bike. I was staying with Bill and his family and when we watched the Weather Channel in the morning it looked like there were going to be a lot of storms on my route. Since I was going to be in the middle of nowhere with no towns, I decided to stay one more day and hope for the weather to change. Of course, the day ended up being just fine without any storms, but I wasn’t really mad, because the family was just so nice and I finally got to chill a bit and organize myself. 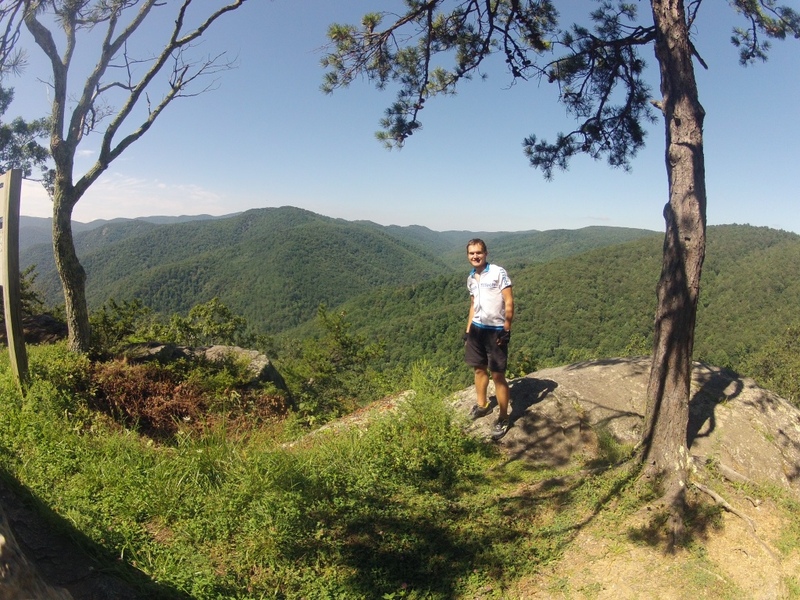 After hitting the foothills of the Appalachians, I had my first real climb on Tuesday. I was going to spend the night at the Cookie Lady’s house in Afton. This town, or let’s rather say these three houses lay on top of a really steep hill (some say it’s one of the worst of the whole trip). 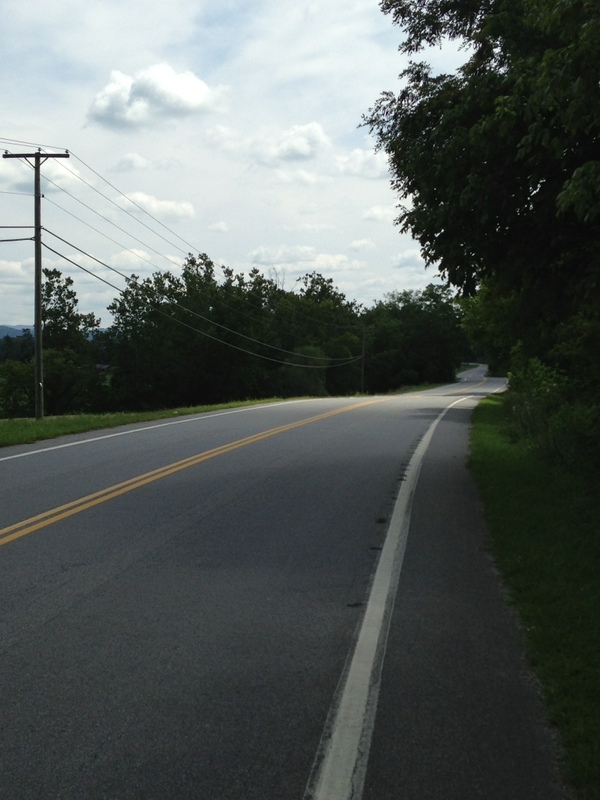 Since there is nothing on top of the hill, I went to get some groceries in the town before – Crozet. A nice guy came up to me there, welcomed me to Crozet and we talked about my trip. Then he asked me if I was ready for some climbing and I realized that the first really tough days were ahead of me. After all, I managed to do the climb to Afton and arrived at the Cookie Lady’s house. June Curry, known as the Cookie Lady, had hosted and/or taken care of over 10.000 cyclists over the last 40 years. 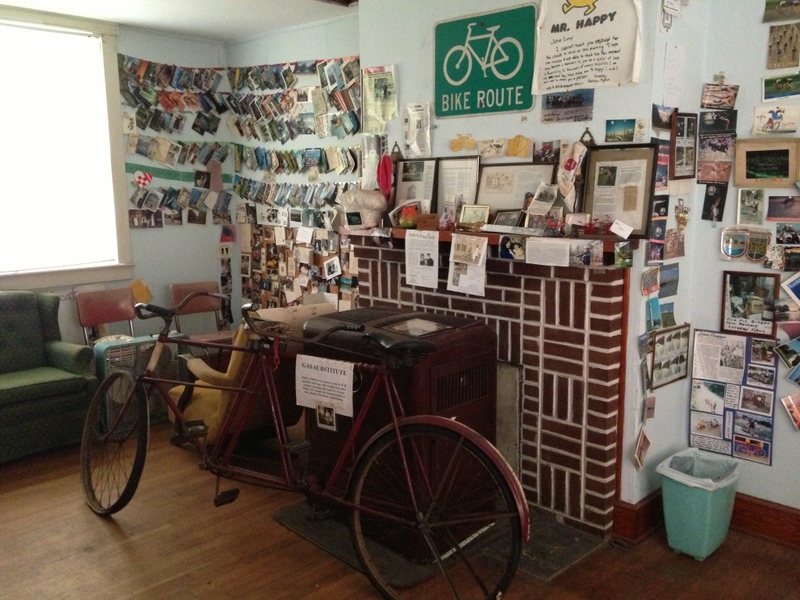 Beginning in 1976, she offered cyclists coming up the steep hill showers, water, a place to rest and of course homemade cookies – everything for free! She is a legend in the cyclist community and unfortunately she passed aways last summer at the age of 91. 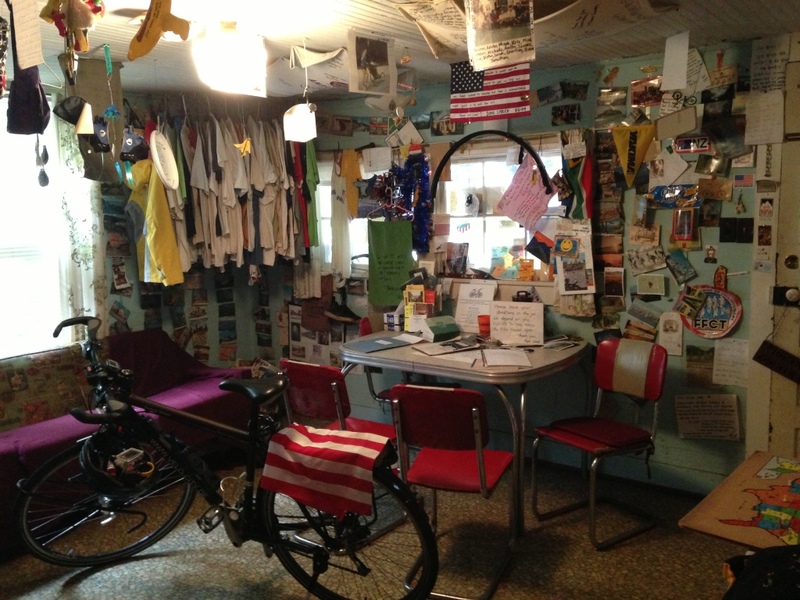 Her house is still open for cyclists and is like a big museum. 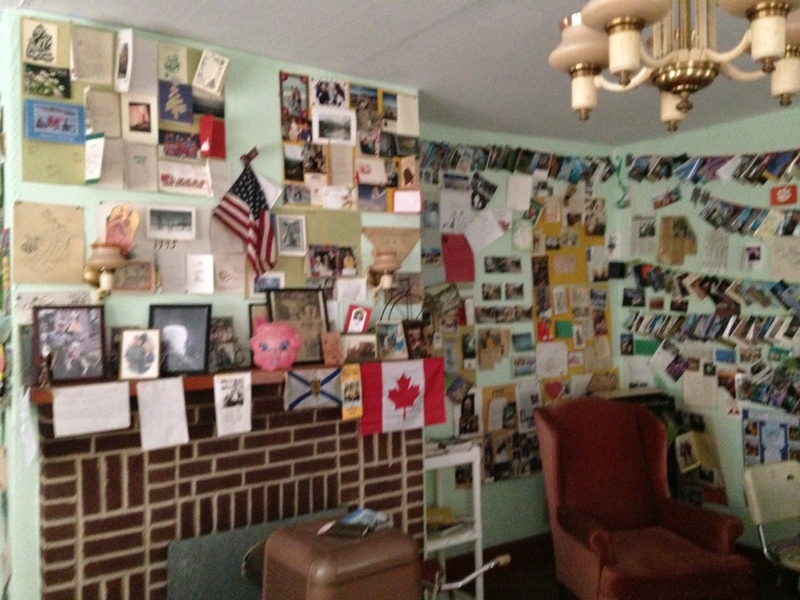 The walls are covered with postcards from all over the world and bike equipment. Shirts, tires, pumps, whatever you can think of is in this building. It’s a tradition to stop there and leave something. 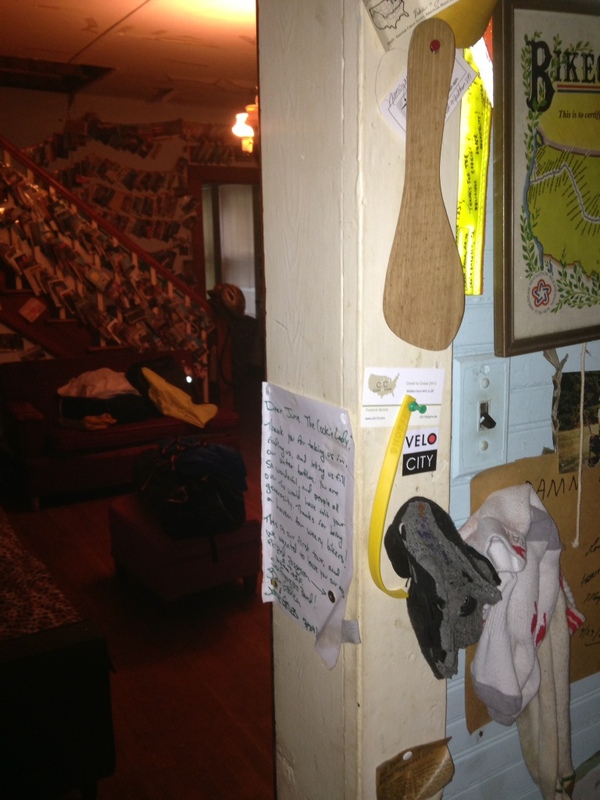 My livestrong-bracelet broke that night so I left it there. It was an amazing place and I spent hours reading the postcards from other cyclists back to the year 1976. The night itself was a little bit creepy though, because it’s an abandoned house. I would definitely recommend stopping there but not necessarily spending the night. 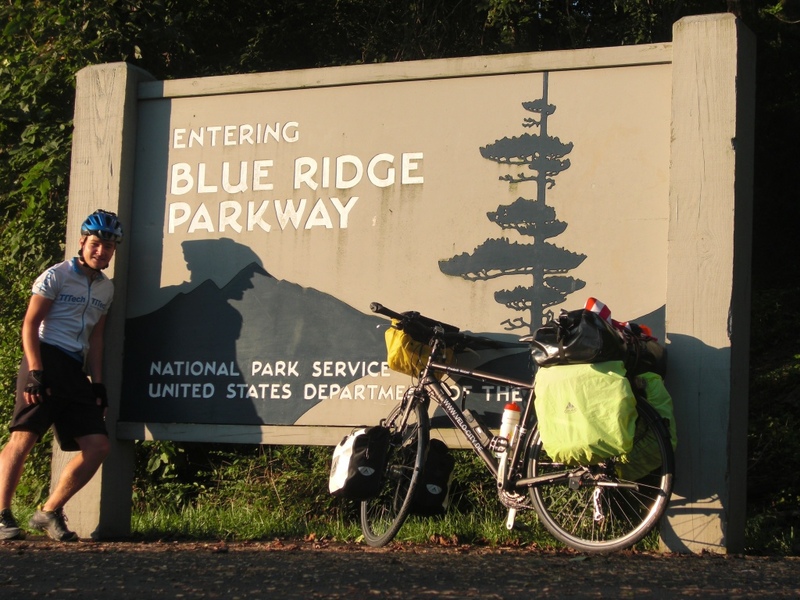 After a short night, I got on my bike at 6AM to tackle the Blue Ridge Mountain Parkway – one of the highlights of my trip. I had perfect weather, not one cloud and it was just beautiful. Of course there were tough climbs but the views were amazing. Unfortunately I had to accept being taken on a pickup-truck for about a mile. There was roadwork ahead and the road was in terrible shape so I decided to push it because I didn’t want a flat tire. The construction worker told me that I would have to ride it because he couldn’t hold the traffic for a long time coming from the opposite side – there was not one car coming for another 20 minutes but anyways. 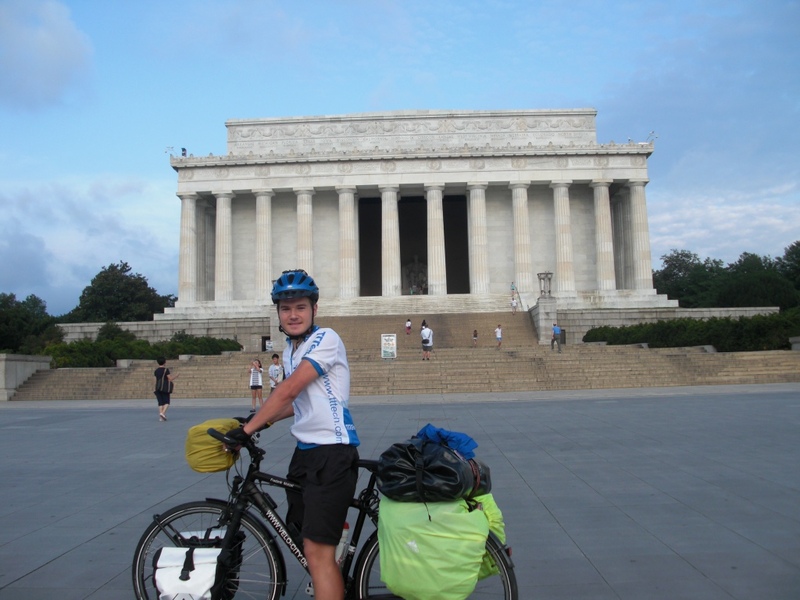 He understood my concern and offered to take me with him until the end of the construction site – so I guess I have cheated and will not cross the US without the help of a motorized vehicle! I might just do an extra mile once I reach SF. But the rest of the day was just great and the descent pretty fast and a little bit scary, because it was really steep. That night I stayed at another amazing family’s place and met 2 other cyclists from Kentucky, Nathaniel and Will. They are also going to the Westcoast but Nathaniel’s leg is injured so they will have to wait a while – hope for them it’s gonna work out. The last three days I have kept going through really tough terrain with steep hills and as I know now: it’s going to stay that way until Kansas which means another 1000 miles or so. It’s exhausting but at least the views are great and in a couple of days I will be leaving Virginia and entering Kentucky – not really looking forward to that though due to the dogs! I never really heard about dogs being a problem until I met some cyclists telling me about dogs chasing you when you ride by. Kentucky is the state everyone mentions in that context. Apparently the owners don’t train them or they simply don’t have owners and are bored. The more cyclists I have met on the way, the more stories I have heard. While most of them say getting off the bike and standing still will help, others have given me pepperspray and an airhorn. I also bought a dog whistle and will see how that works. So far I have been chased by about 5 dogs, but mostly small ones and not really aggressive. The whistle has worked and I hope I’ll never have to use the pepperspray but we will see. Dogs are definitely my biggest concern for the next 1000 miles because everyone who knows me knows that I am pretty scared of ‘normal’ big dogs – so imagine a wild dog running after me..but I’m sure I’ll be fine. – I’m starting to meet ‘a lot’ of cyclists on the way. Most of them coming from the westcoast and about to finish their trip on the eastcoast. It’s crazy to ser the diversity. 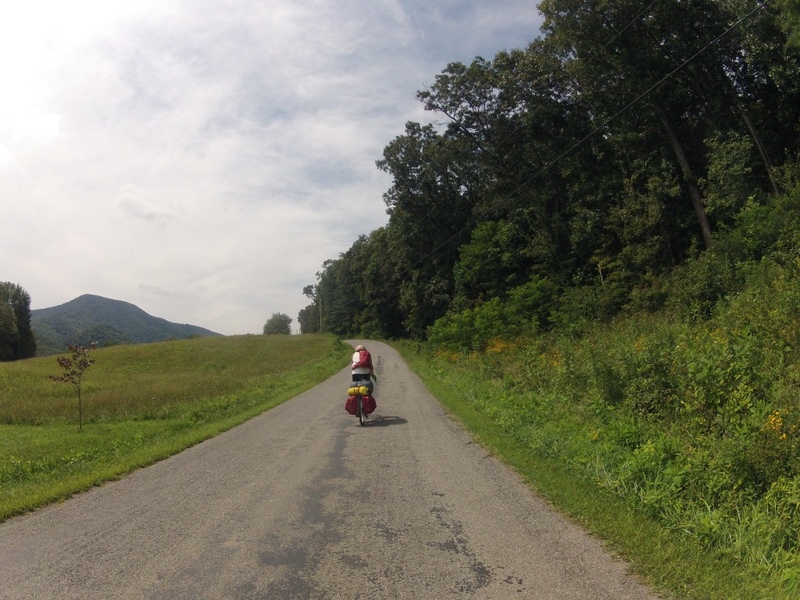 A girl riding from Oregon to Rhode Island by herself. A father and son from San Francisco to Virginia. A Canadian from Vancouver. A 67 year old from San Francisco to Yorktown and just today a Dutch couple coming from Oregon. It’s just crazy to see how “many” people share this hobby and it’s nice and fun to share stories and advice for the next couple of days. Since we are all taking the same route, you run into people you have heard of before. Nathaniel and Will had told me that one friend they had started the trip with had decided to go on by himself because he needed to make it to the west early. One day later I run into the third guy, Peter, and we have been riding together for the last couple of days on and off and will probably run into each other every now and then until he will go North towards Seattle im Colorado. 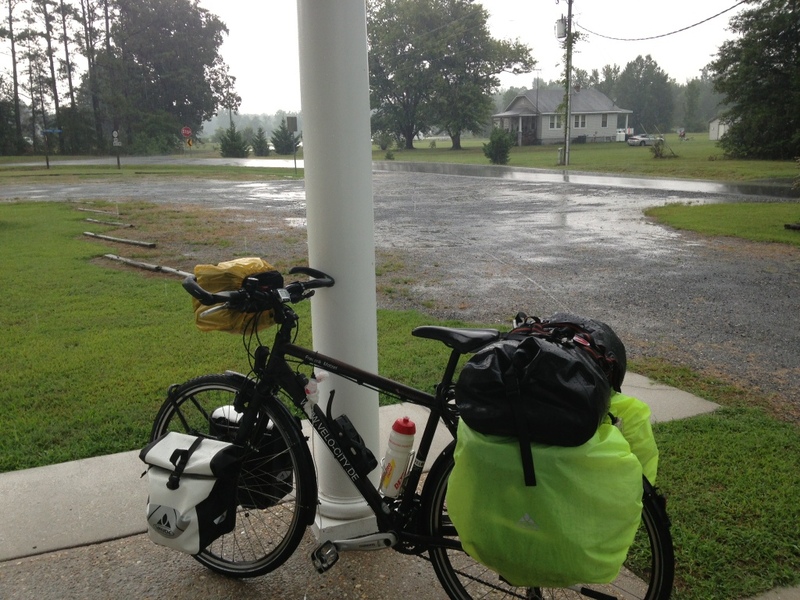 -And the scariest moment on this trip has nothing to do with my bike, but a bathroom at a gas station in Mineral, Virginia – a very small town! I decided to fill up my waterbottle there and as usual the bathroom was aroud the corner of the store. Usually I always carry my handlebar-bag with all my important stuff with me, but since I was in the middle of nowhere, I just left the bike infront of the bathroom door and walked in. I was going to put something in the way of the door so it wouldn’t shut, but I didn’t and as soon as I wanted to get out of the bathroom I realize I should have! I was stuck! The door just wouldn’t open anymore and I was panicking. ‘When will the next person in Mineral go to the gas stations bathroom! ?’ or ‘What if someone takes your bike?’ were my biggest concerns. After knocking, banging on the door and screaming for help I started throwing myself against the door. I did that for about 2 minutes when someone comes to the door and asks with a really heavy Southern accent: “Are you stuck in there?”. (“No I’m just casually throwing my body against a bathroom door and screaming for no reason” is what I wanted to say). Together we got the door to open and I was happy to see that my bike was still there. The toothless redneck who was really nice in helping me to get out of the door just said: “hehe, you were stuck!” and went in the bathroom. I went into the gas stations store to get something to eat when another guy comes in to tell the owner that “someone is stuck in the bathroom”. From that moment on, the owner handed out a key to everyone who wanted to use the bathroom because he didn’t want anyone to get stuck in there anymore. I’m glad that my trip is helping people along the way. Now noone in Mineral, Virginia has to worry about getting stuck in the gas station’s bathroom anymore. Ok, that was it for the week. Unfortunately I don’t have internet available in some towns I’m staying at, but I hope to be able to keep up with the blog every week. 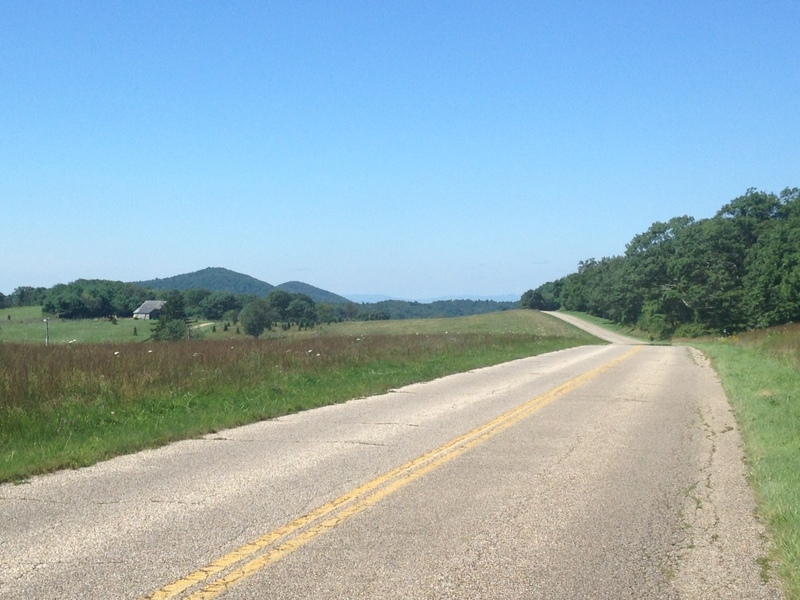 Right now I’m in Wytheville, Virginia and Peter and I have been dreaming about finally heading out west and leaving all those hills behind! But it’ll be a while. 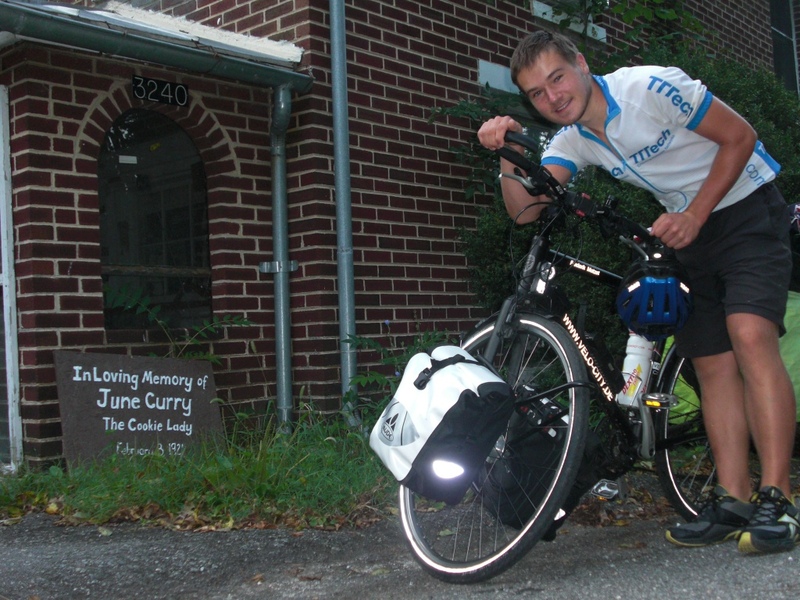 My plan is to reach Berea, Kentucky next Friday and then I’m going to have my next restday and update the blog again! P.S. : I want to thank all the hosts again for the incredible hospitality! I wish I had the time to write down all the stories, but I will not forget them! 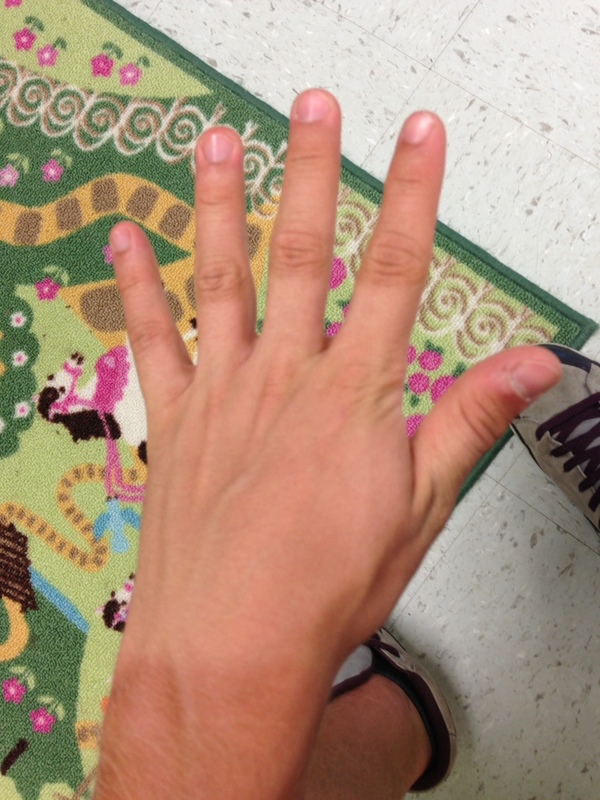 This entry was posted in Uncategorized by jeffstrasser. Bookmark the permalink.